These fine young men are but four of Boy Scout Troop 138. It has been my pleasure to help these youngsters earn their Environmental Science Merit Badge. I spent the day with them at South Mountains State Park, where we studied the stream environment of Jacobs Fork. We looked for macroinvertabrates and discussed the role of macroinvertabrates in the stream environment as an indicator species. These four young men met the challange with a great deal of enthusiasm and with a young mans heart for exploration and discovery. 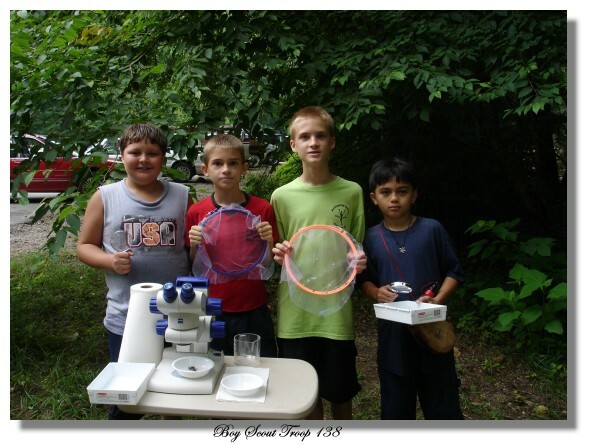 Armed with the Stemi DV4, nets, pans, and magnifiers they studied the life within Jacobs Fork. Watching and working with these boys makes one feel just a bit sad though. As I watched them, my mind went back in time to much simpler days and happier times. Hey neat Ken . It would be great to start a forum for the younger ones here. So if you ever get any ideas on it, let us know. I'm all for it. They are the future eyes for all of us. All the best Ken, good on you. Thanks Danny These four guys here have been really great to work with. It is funny--Back when I was the appropriate age, I remember Boy Scouts as looking much older than this! Ah, I was a cub scout and a Webelos (what a name). For reasons that now baffle me, I chose not to go onto Boy Scouts. Probably would have benefitted me if I had done it. I saw the move "The Poisiedon Adventure" at about Webelos age in the theater, then saw it again a couple of years ago for the first time since then. Gene Hackman looked surprisingly youthful (younger than I am now), and played the part of a rebellious and anti-establishment young priest very well, including the tragic scene where he sacrificed himself so everyone else could escape. I figure this must be a different version than I saw when I was about 12 or 13, since the priest there was some old guy, and I recall thinking that he probably didn't mind sacrificing himself because he was going to die soon anyway! Couldn't possibly be the same actor.